Mahindra & Mahindra recently launched its latest car - the TUV 300 Plus. The car is an extended and longer version of the TUV 300 and has a seating capacity of nine people. Mahindra & Mahindra recently launched its latest car - the TUV 300 Plus. The car is an extended and longer version of the TUV 300 and has a seating capacity of nine people. The car comes with a powerful engine and exciting features like Bluetooth telephony, ECO mode and Intelllipark Reverse Assist. The P4 variant of the TUV 300 comes with automatic door locks and Boot-mounted spare wheel cover. The interior of the model features Vinyl upholstery, powered headlamp adjustment and tilt adjustable power steering. It also comes with internally adjustable outside rear-view mirrors and power windows. The P4 has manual AC as well as phone charging point. 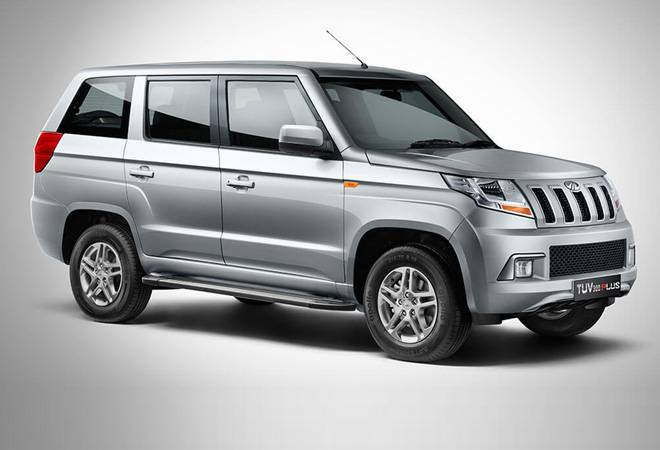 The TUV 300 Plus P4 is priced at Rs 9.47 lakh (all prices are ex-showroom Mumbai). The P6 features dual-front airbags for safety and also features ABS with EBD. The car comes with a body-coloured bumper, grille, door handles and outside rear-view mirrors. The car comes with wheel covers. The interior features fabric upholstery. This variant comes at a price of Rs 9.83 lakh. This is the most expensive variant and it comes with chrome on the grille and fog lamp surrounds. It features blacked out pillars and 16-inch alloy wheels. The interior of the P8 has got faux leather upholstery along with 7-inch touchscreen infotainment system with navigation. It has four speakers and two tweeters and also the Mahindra Bluesense app compatibility. It features a reverse camera with rear parking sensors, power adjustable outside rear-view mirrors and steering mounted audio and phone controls. The P8 also has rear defogger and wiper. The TUV 300 Plus P8 also features remote lock and keyless ignition. It has illuminated glove box, front center armrest, and driver's seat height adjustment. The P8 comes with Follow-me-home headlamps and flat-folding feature for the second row of seats. The Mahindra TUV 300 Plus P8 variant is available at a price of Rs 10.86 lakh. It must be noted that all the three variants - the P4, P6, and P8 will be powered by the 2.2-litre, four-cylinder, turbo-diesel engine which is called the mHAWK D120. The engine will produce maximum power of 120hp and a peak torque of 280Nm. The engine has got a micro-hybrid technology and has a 6-speed manual transmission.